Performance under pressures. 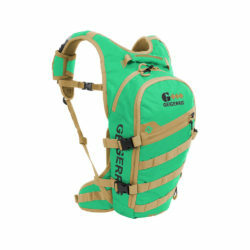 The RIG 650 hydration pack is a highly versatile pack ideal for high impact sports. Plenty of storage options and organization means you can play hard and carry everything you need for a day outdoors. Ride hard and play more with the Geigerrig RIG 650. The RIG 650comes with a 2 liter reversible, top-rack dishwasher safe hydration engine with a lifetime warranty. The water stays close to your back for optimal balance and room for extra gear. This pack includes several pockets for storing gear for the day. The RIG 650 was built with mountain bikers in mind and has a unique helmet carrier and bike pump sleeve. The RIG 650 comes filter ready with a FREE Aquamira Frontier Max Filter Casing ($15 value). Customize your Frontier Max with any Certified Series IV filter to make the ultimate hydration system.